The SXSWedu Conference and Festival is an annual conference focusing on innovations in learning. SxSWedu hosted a diverse global community passionate about the future of teaching and impacting learning in the classroom and beyond. Attendees at the 2017 conference included practitioners and administrators, students, business and industry representatives, and government and nonprofit representatives. The Arthur Interactive Media (AIM) Buddy Project was featured in a panel discussion that focused on how to help kids move forward in our turbulent world. 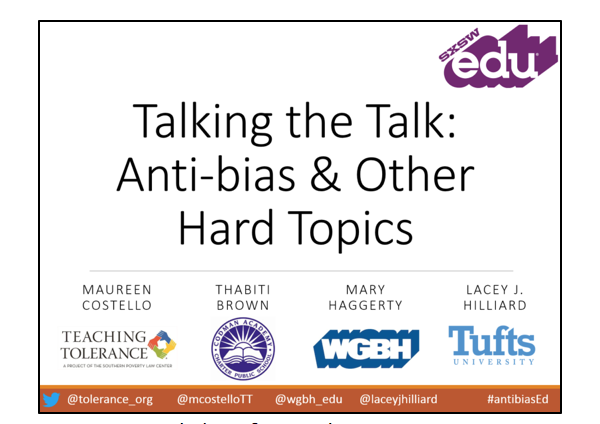 The presentation topic, “Talking the Talk: Anti-bias and Other Hard Topics,” was selected from a wide variety submissions through a popular community vote. Thabiti Brown, Head of School, Codman Academy Charter Public School, MA. Maureen Costello introduced Teaching Tolerance’s anti-bias framework and spoke about the need for rapid response from industry and research. Thabiti Brown discussed challenges his school faces regarding social issues and stress. He presented strategies to help schools process challenging situations and take action in fair and compassionate ways. Mary Haggerty discussed how using children’s media can be a powerful, effective tool in connecting with children and helping them unpack difficult issues. AIM Buddy Project was highlighted in this discussion. Lacey Hilliard described her role as a researcher of positive development and social justice and presented initial findings and feedback from the AIM Buddy Project study. Audience interaction was encouraged and questions were addressed throughout the panel discussion. 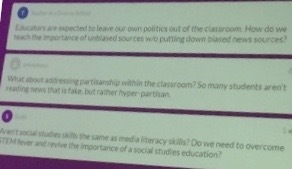 The themes of collaboration, equity and justice, learning through innovative technology, and social development were well represented at SxSWedu. Watch videos and highlights from the 2017 conference. Or visit the website to learn more about SxSWedu.